In a recent post I wrote about a 'good week' in which I'd appeared on national television talking about home brewing (still feels quite surreal!) and received some recognition for a couple of beers I'd brewed - a week that would take some topping. Rather astonishingly, I think last week blew that one out of the water. Late last year, The Craft Beer Company announced a competition in which they were "searching for the UK's greatest undiscovered brewing talent". 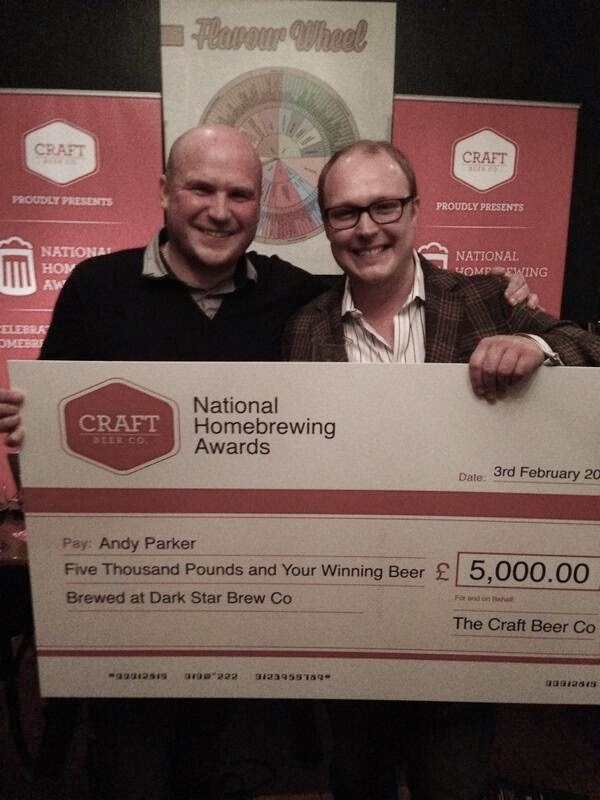 The prize was a staggering £5,000 in cash and the opportunity to have the winning recipe brewed with Dark Star Brewing. To a home brewer, this was a huge carrot to dangle and it immediately caught people's attention, myself included. The beers were duly judged in mid-January and the prize giving confirmed as being on 3rd February at Craft Beer Co Islington. The gap between judging and prize giving gave plenty of time to ponder about who and which beer might've won and I found myself flicking through the entries on the website (handily plotted on a map!) mentally trying to taste them and connect them with the brewer. The prize giving night soon came around and the pub filled with entrants, who were all no doubt feeling as tense and nervous as I was, all daring to dream a little - could it be me!? The prize giving kicked off with Tom Cadden and Martin Hayes giving speeches. Tom spoke very highly of the standard of entries they'd received and Martin gave some background as to why they'd launched the competition and said the idea behind the prize money was to encourage the winner to go professional. He also thanked Dark Star for getting behind the competition. Martin then advised that so high was the standard of entries that they'd decided to give out six honourable mentions before announcing the runner up and winner. I was sat with Chris Taylor and Emma Victory (of Crema Brewery) and was delighted for them when their name was read out amongst the honourable mentions for their excellent Red Snow Rye. What followed remains something of a blur but the runner up was announced before Martin started talking about the winning brewer and beer - an American Red. I had a moment of complete disappointment before remembering with a start that I'd entered one! Then it hit me. Hard. It was one of those moments where you don't quite know what to do with yourself. I sat there, head in hands, trying to take it in - "and the winner is... Andy Parker". Tom Cadden (right) and my big grin! After what felt like an age (but was probably only a few seconds) I got to my feet and headed towards Martin, who was holding a large novelty cheque with my name on. Handshakes and congratulations. Photos. More handshakes and congratulations. Was this really happening? I was flabbergasted. Completely knocked for six. Then my phone started buzzing - tweets from everywhere offering congratulations. After a few minutes I went outside, composed myself, text my wife, Jane (who was abroad and gutted she couldn't be there) and phoned my parents to tell them. Having gathered my thoughts, I headed back in, sat back down at our table and grabbed my beer as I started letting things sink in a bit. Thornbridge Chiron has never tasted as good as it did right then. Many more beers were opened and shared with friends that night and it's one I'll never forget! A huge thank you to Martin and the team at Craft for putting on a fantastic competition and awards ceremony. They are very supportive of home brewing and this competition (which will run again next year) underlined that and then some. Thanks also to Dark Star for getting behind it. I'm very excited about brewing the American Red down there. I hope they have lots of Simcoe and Citra on hand! I haven't yet dared work out exactly what the recipe looks like at a 45BBL brew length but am pretty sure the volumes and cost of the ingredients will terrify me. In the two weeks that have passed since that night, I've had time to think about things and the future of Elusive Brewing. More on that in a future post!